HMH Designs: Put Some Files In It! My husband and I are really bad at keeping our files organized! I have a bad habit of throwing things in a cabinet drawer and having to search for it when I need it. 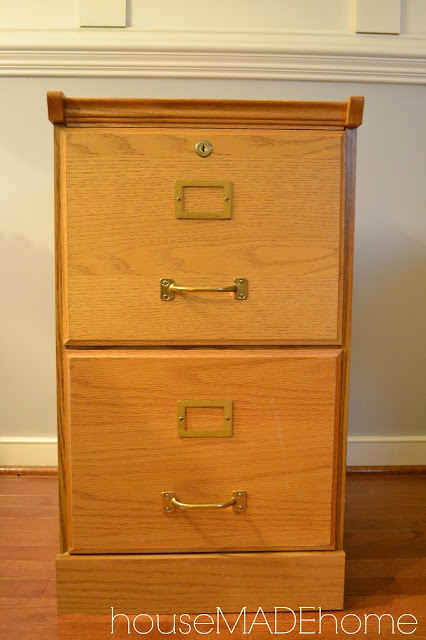 So I decided that I needed to be a big girl and starting using a file cabinet. While thrifting about seven months ago, I know SEVEN months! I couldn't believe it either! If I didn't snap a picture of it on Instagram I would have thought it was only a few months ago. 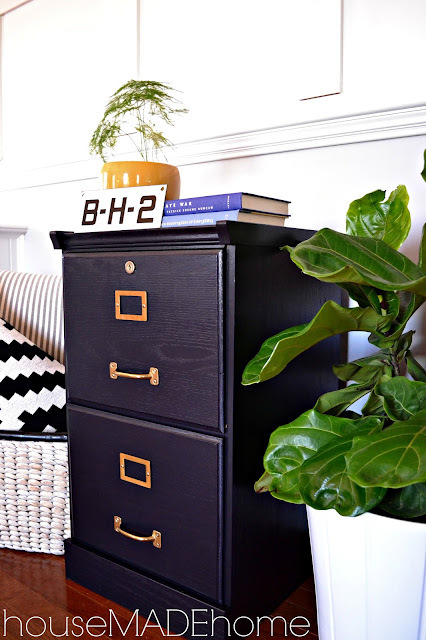 I found this cute file cabinet with even cuter hardware that needed a facelift! When I brought it home I sat it in our living room until I could find a spot for it, since I no longer have my own office. I never used it! I always just sit down with my laptop in the living room or in bed, while my three year old is playing. I have to keep an eye on her! I never know what she might get into. Anyway, for seven months it's been sitting in the same spot and has become a side table. It's a drop spot for our keys and should be holding our files, but it's still empty! I decided it was time to get organized and make this appropriate for the space. Yep, it was a keeper and for right now it will have two functions: organization and side table duty! I found some oops! paint at Lowes one day that I brought for a different project and changed my mind (surprise, surprise), that I decided I would use on the piece. Everything in our house is either white or a light neutral and I wanted to incorporate some warmth into our color palette. First I removed the hardware, and painted the first coat with a brush. No I didn't sand it! I hate sanding or stripping furniture and I will only do it when absolutely necessary. I used Valspar paint + primer and gave it three additional coats and it turned out amazing! I'm in love with my oops! paint (it's a dark navy) and goes well with our neutral, bright, and airy blues and whites. Now all I have to do is put some files in it! Those filing cabinets made over look great! You did a great job of working them in with your room! Very creative! Thanks Joanie! I'm so happy with them. Love your inspiration find and your cabinet refinish! Pinned:) I posted Halloween banner to the party! Thanks Michele we're in love with them. Gorgeous! 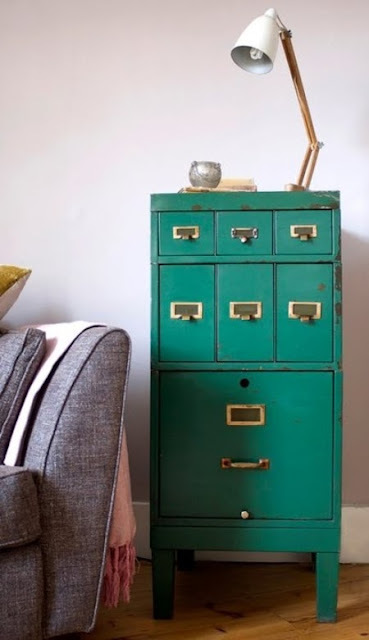 I have a five drawer metal monstrosity in my downstairs office space that is in desperate need of some love.... someday! I'm pinning, and thanks so much for sharing it at the Pinworthy Project Party! Thanks for much! I would love to see what you end up doing to your cabinet! I would have never thought to use a filing cabinet as a side table, but it's genius!!! I have an old black 2 drawer cabinet buried in my room. I might have to dig it out and put it besides my bed. If I can see it, I might actually use it. 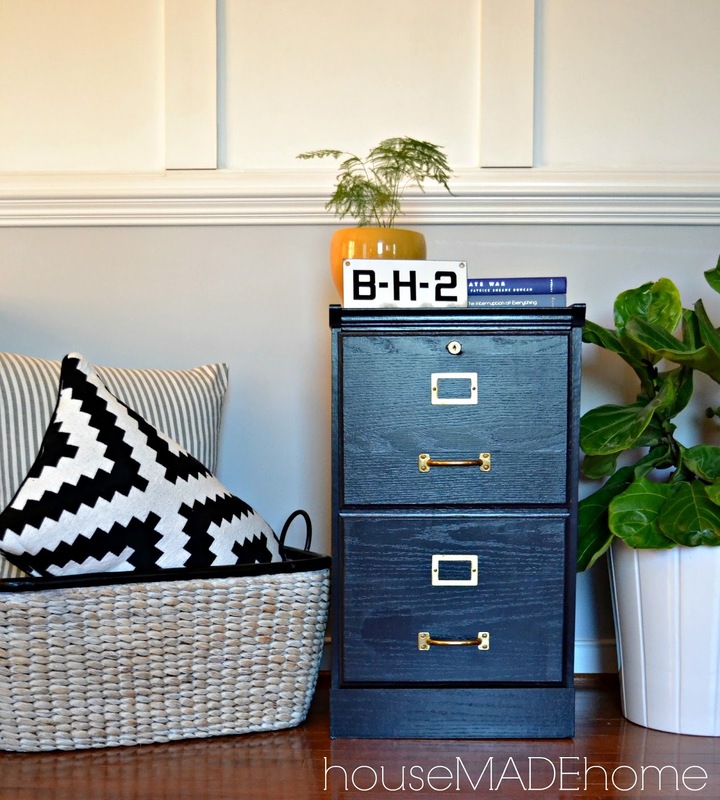 I'm glad that you were inspired to create your own side table!